Archaeology student Chione has vivid dreams about the discovery of an opulent tomb. After the founder of the Institute of Archaeology learns that Chione’s dreams might be connected to events in Egypt, he accepts an offer to examine a mysterious site in the Valley of the Queens. When they discover a burial chamber, ancient spells transport Chione and her ex-boyfriend, archaeologist Aaron Ashby, 3,500 years into the past. There, they learn of Tutankhamon and Tauret, a priestess in Pharaoh's Court. Soon, Chione and Aaron learn that they have been chosen to play a crucial part in Tauret's plan. ★★★★★ - "If you're a fan of Egyptian-themed reads or anything with a paranormal edge, this one is for you." ★★★★★ - "Intensely absorbing fantasy entwined with true history." 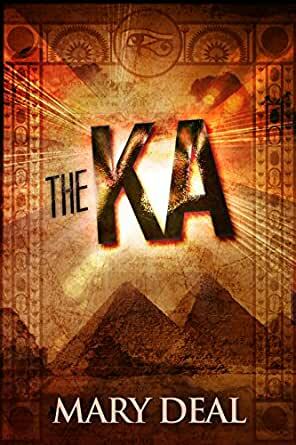 From the opening scenes in which a group of hot-tempered academics prepare to uncover a forgotten Egyptian tomb, The Ka draws its readers into a mystery centred in the ancient history of the pharaohs, one that pivots on mysticism and the paranormal. This is undoubtedly a potent mix. Distinct and believable characters fumble and tumble their way through discovery and danger. The author clearly knows her subject, and provides a vivid and detailed portrait of the tombs and pyramids of ancient Egypt, along with the stories, the tragedies and cruelties, and the betrayals that went on. The historical exposition is cleverly woven into the narrative in the conversations among the party and in the mind of the protagonist, Chione. The story maintains a good clip and is well-plotted with plenty of twists and surprises. The plot is driven by Chione, who endures many dreams and visions, at times clear, at others murky. Through Chione, Deal blends the present with the ancient, all the while imbuing the narrative with a looming sense of dread. Danger, is everywhere, as pervasive as the sweet odour that so enchants Chione. Questions prevail, not least what is it between ex-lovers Chione and Aaron and will they re-unite? As the story unfolds the past and present collide in a dramatic way. Suddenly, ancient Egypt is a lived reality, not something dead and buried, but alive and influential, having lured Chione and Aaron back in time and trapping them there. What unfolds makes for a highly engaging read. Original, refreshing and captivating from first to last, The Ka will appeal to historical fiction fans with a fascination for the supernatural. Chione was in awe making her way around the immense dimly lit chamber. Magnificent history spoke from the etchings. Her heart quickened. She wanted to read and learn who had been laid to rest in the burial chamber of this opulent tomb, yet the unfinished tasks at the first tomb took priority. Tauret's tomb would not allow her to focus her attention elsewhere until the mission of that discovery could be satisfied. As far back as I can remember I always wanted to be an Archaeologist, but I had one really big problem. I'm very claustrophobic. So I now rely on old things above ground and reading about those below ground. In The Ka, Chione took me not only to the Valley of the Queens, she also took me on a journey where history, in a sense, sometimes repeats itself. With all its history and vivid detail, the author must have spent vast amounts of time doing research. Chione, along with a group of archaeologists embark on a finding that will take them deep into the earth and all of this has come about due to the dreams and visions Chione has seen. But it seems that this group of archaeologists are not as normal as they believe they are. They have been brought together to do something more than uncover history. They, too, are just as special as Chione and as time goes on, they will see for themselves just why they were all brought together. So, I now have one question for you. Do you believe in reincarnation? If not, you might after reading The Ka. To be completely honest, I never considered myself to be a fan of ancient Egypt and the known myths of mommies and that kind of stuff. However, I don’t let those things to keep me from reading this book, and I’m glad that I was wrong. While searching for clues about some unexplained dreams, Chione convinces her ex-boyfriend, archeologist Aaron to explore an ancient burial, unknown to them, an unseen force teleports them 3000 years to the past, to the time they had been exploring the most, ancient Egypt. Famous names and figures appears in this story and the plot is nothing like you were expecting, the twists left in awe every time I turn a page, shock after shock, this book is mesmerizing. If you are worried you might not understand a thing or two, don’t worry, the writing and certain clues and details are occasionally detected here and there for you to not lose or miss anything that might happen, this is an excellent take of mommies and archeology, don’t miss this opportunity to learn a few new things! This action packed story about an archeology student named Chione was interesting to read. Especially with the recent discovery of a new hidden chamber in one of the pyramids, this story becomes almost fiction. Almost, if not for the time travel part. Chione is compelled to travel to the valley of the queens in Egypt after she starts having recurring dreams about an undiscovered tomb. Together with the founder of her Institute and her archeologist ex-boyfriend Aaron, Chione discovers that her dreams about this tomb may not have been just happenstance. Transported back in time, Chione and Aaron have to figure out a way to return to their own time and escape being used by Tauret for his own nefarious purpose. An engaging story, it has been some time that an author has been able to grip and mystify me in such a fun and intriguing way. The story was original; it did not feel as if I was rehashing some other story with new characters. The writing was good and I did not find any major errors that jarred me out of the story. With a little bit of history, a little bit of mysticism, and a lot of paranormal events, The Ka by Mary Deal is a great book for anyone interested in the Egyptian pyramids, tombs, Tutankhamon and more. The main character, California archaeology student Chione Ini-Herit is beginning to have vivid dreams about a special tomb. She travels to Egypt to explore more about these dreams, along with an archeology team, and comes face to face with the Valley of the Queens. She has no way of knowing she will soon be transported to ancient Egypt, along with her ex boyfriend. With well developed characters, a keen sense of history, and a fast moving plot, this is an exciting book especially for history buffs. While some of the detail may drag in places, the emphasis on the paranormal and exceptional depiction of visions and the mystical, makes this book a formidable entry into the paranormal/history genre. An interesting story that would fully support a sequel to see what the characters are up to next. This is a good story about the Egyptian valley of the queens and a team of archeologists who are set to discover something beyond the belief of anyone past or present. With one member who has visions and another who feels an attraction this is a fast paced twist of time and fate. This story spans the current and pulls members of the team into the past to become unwilling participants in an ancient ritual. The characters are well developed and the story is a great journey through ancient Egypt and the past kings. I love the pyramids and have always liked this type of story. I would recommend this one to anyone. It is a great journey through an ancient time and place. 5.0 out of 5 starsGreat read. Kept my interest throughout. Good storyline about archaeologists digging into lost pyramid & tombs. Romance & intrigue. If you divide the story into 3-parts, the 1st part is really exciting and draws you into it, the middle part got me kinda lost& drifting away from the intrigue & romance of it. I thought it distanced itself away from the excitement from the 1st part, and the last section summed it all up pretty nicely again (like the 1st). I don't know.... pretty much similar storyline approach to alot of the other Egyptian novels I've read.